When your toddler starts to write, the very first thing he needs to cope up with is holding the pencil firm enough so that it facilitates his writing. Pencil grip is among the things quite hard to re-teach in case the kids learn it all incorrectly in the initial stage. Though every kid ends up settling on the pencil grip that works the best for him or her, however; introducing a standard “tripod” grasp i.e. pinching with thumb and the index finger while relying on the middle finger is certainly a good place to start with. Here we have got for you the 3 wondrous tricks to help your toddler learn the art of holding the pencil correctly. A shorter pencil calls for lesser space for cramming in the unnecessary fingers. It forces the child to pinch with his thumb and the index finger. 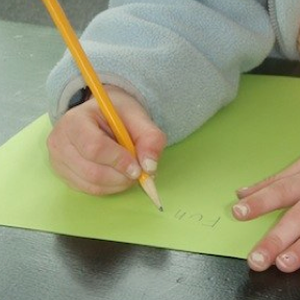 When they work with a shorter pencil, they learn to hold it firmly and with a better grip. This is the reason, the occupational therapists can often be seen making the kids use half broken crayons if the kids experience trouble in using the age-appropriate grasp. Well, it is not necessary for the kids to master the art with the first trick. Some kids might fail to learn the art of gripping even after working with smaller pencils. If your toddler also experiences the same, teach him the “pinch and flip” method. Make him pinch the sharpened end of pencil and flip it around till it gently takes rest in the “webspace”, which is the soft skin between the thumb and index finger, in the ready position. So you have tried both the short pencil and pinch & flop method, but your toddler is still struggling with the grip. Well, if the problem is still persistent, you can now try a different way. Try hiding something under his little and ring fingers. These two fingers bend toward the palm while thumb, index, and the middle fingers aid the writing work. However, at times the kids have a tough time with this as they fail to “separate” these two sides of their hand. Hiding any thing under these fingers will do the trick. It doesn't really matter as to what things are hidden under the last two fingers, till the time the toddler is comfortable doing so without the fingers bulging out from the hand because either the hidden item is quite big, or needs to be squeezed very tightly as it’s too small. You can try making use of a small ball of a clay or playdough, cotton ball, bead, crumpled tissue paper, tiny rubbery toy or marble. In addition to teaching kids holding the pencil correctly, you must also see that they have strong hand, shoulder and core muscles so that they can sit up and write with control. Try the Crossover grip. It helps in keeping the fingers where they are supposed to be. You can even use the writing claw, as it also helps in firming the grip. So now you know how you can help your child hold the pencil grip correctly, remember if you fail to teach this at the present stage, your child will face writing problems ahead!